Do you struggle with wanting to create amazing crafts for every season, but feel like you just don’t have the time or space? 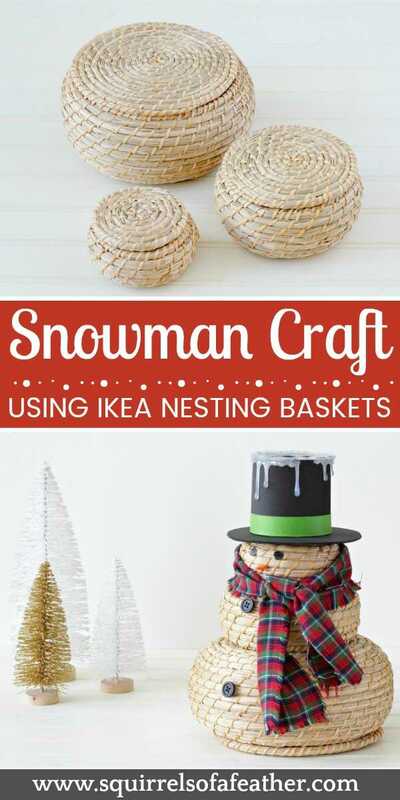 Well, today I am going to show you how to create an adorable snowman using IKEA nesting baskets. 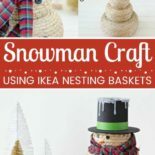 Best of all, when winter is over this snowman craft can return to being a nesting basket set! 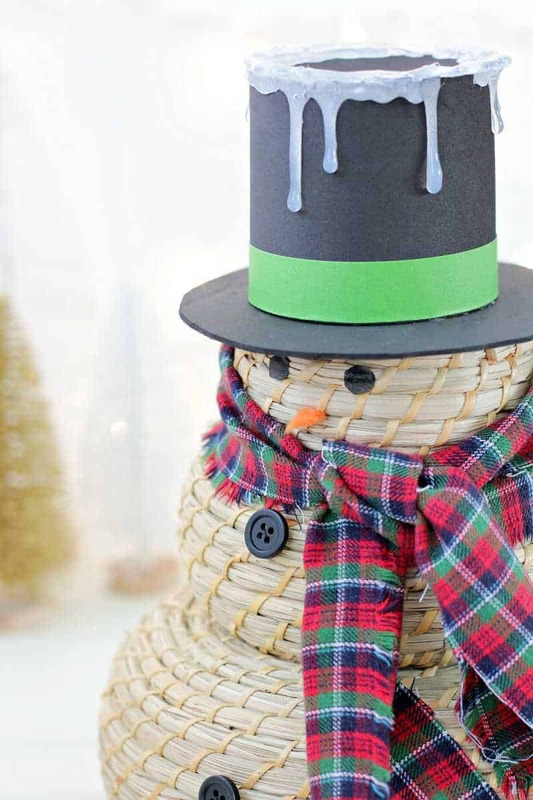 Read on to see how to create this friendly snowman craft. Who doesn’t love IKEA? We actually own two sets of these sweet lidded nesting baskets, woven from seagrass. I got them ages ago from IKEA because I knew they would be super handy when trying to organize small toys and bathroom items. It’s always cheapest to buy the baskets in person from IKEA; however, I realize that often people don’t have an IKEA very close to them. If you don’t have these baskets already and are not within driving distance of IKEA you can luckily find them on Amazon. If you use my method, you can repurpose your baskets easily for organizing when winter is over and you are ready to take down your holiday decor. Many of the items used to make this snowman were scavenged from crafts and items I had just lying around. For example, the snowman’s flannel scarf was repurposed from a pair of my husband’s old discarded pajama pants. I cut off a leg, cut it to length, and frayed the edges a bit to give it a rustic feel. Use your imagination! 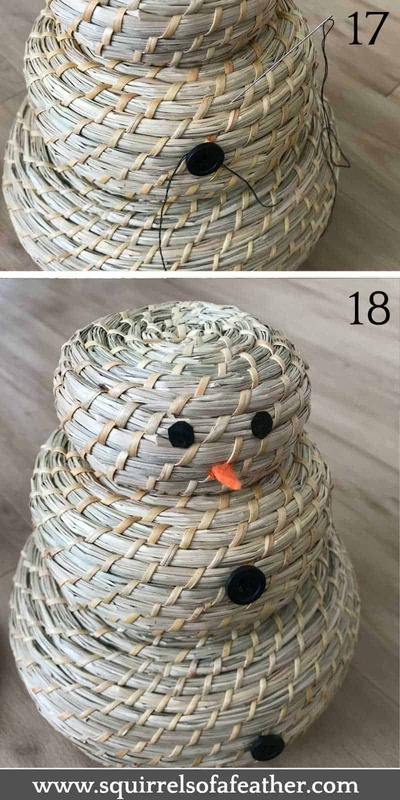 If you don’t have kids and/or don’t plan on moving this snowman around a lot, you may choose to skip steps 1-6; alternatively, if you don’t care about reusing the baskets after the holidays you could just hot glue the baskets together instead of using my method! You will not use the smallest and the medium sized lids, you can set those aside. Measure fishing line the length of your arm span twice and cut. Thread the fishing line through a medium size needle and tie the line so it is doubled with the knot at one end. The top and smallest basket will be the head. 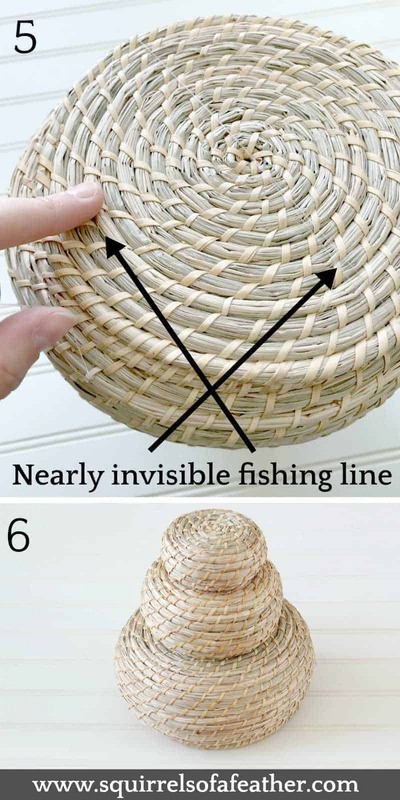 Take the fishing line with the needle and sew from the inside of the thread to the outside of the basket so that the knot locks on the interior of the small basket. Keeping the fishing line taut, thread the line through all of the holes in the baskets. Place the lid on the bottom of the large basket and thread the fishing line through the hole there. Now take the thread and use the little loopy parts at the side of the lid and the basket and sew them together using the fishing line. Check the picture below to see the barely-visible fishing line. 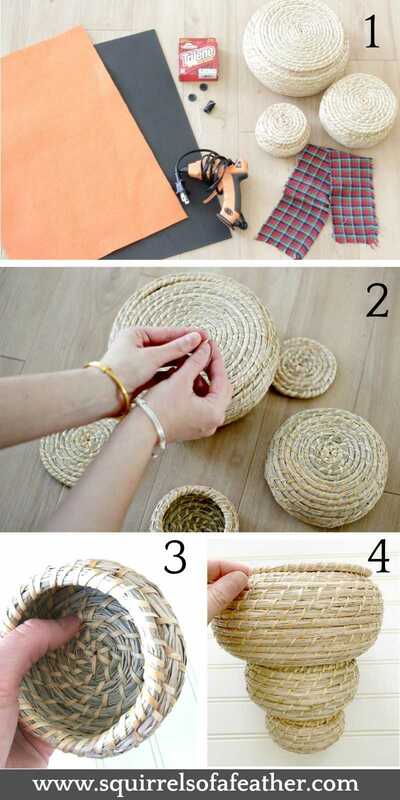 You basically just want to sew the lid to the bottom of the basket using the fishing line so that the three baskets and the lid fit snuggly together. 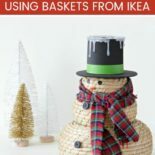 Place your snowman with the largest basket at the bottom and the smallest at the top. He is ready to be decorated! I used the largest lid and the smallest lid to measure a template for a hat; you will need to cut out two circles. The biggest circle will be the bottom of the hat and the smallest will be the top of the hat. Then I had to do some actual math to figure out a good size for the crown of the hat (the part that connects the top and bottom circles. Math is a painful (but sometimes necessary) evil. 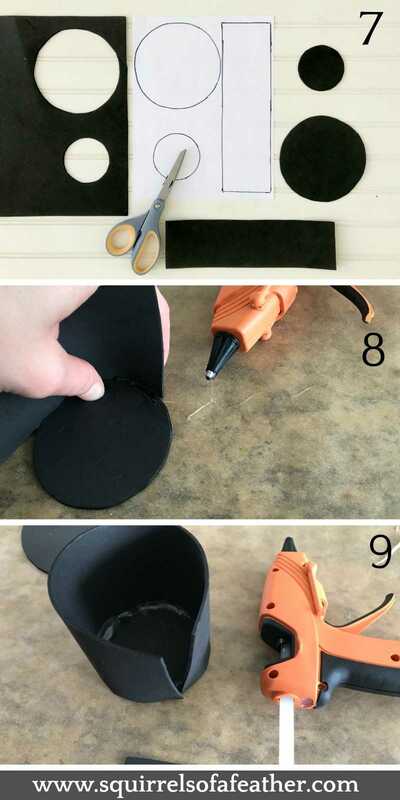 You can either just wing it by cutting out your black foam circles and adjusting as you go using the basket lids like I did OR you can save yourself the pain (of math, shudder) and get the template that I created specifically for this project. 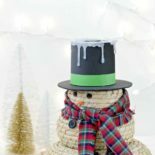 Sign up using the form below to get instant access to your printable snowman hat template (and more) in my free printables library. Place parchment paper down on the table or work surface, taping it with painter’s tape so that it will not move. Using the hot glue gun and working in small sections at a time, glue the sides of the hat to the top circle on the inside seams. The KEY to this step is to press the sides firmly to the edges of the circle while it is drying and HOLD IT until it is completely dry. Once one section is dry, move to the next and repeat until all the sides are glued to the circle. *If you want to make things easier on yourself, skip this step and just glue the overlap of the sides of the crown together. At this point, I cut off the excess of the hat’s crown, but I kind of wish I had not and just overlapped the edges instead. *If you skipped step 9 you can skip this step as well. If you decided to cut off the excess, use painter’s tape to tape together the outside of the hat’s sides and then glue the inside of the hat together, running glue all up and down the hat seam. This step was an absolute stroke of genius if I do say so myself. I did not originally plan to make this, but once I saw how pretty the effect of the clear glue was dripping down the sides of the hat, inspiration struck. Take the small hat crown and trace gently around the circle on the parchment paper with a pencil. Then, take the glue gun and trace the circled pencil mark to make a glue circle, empty in the center. Allow the circle to dry completely. While your glue circle is drying, now is a good time to attach the crown of the hat to the bottom. 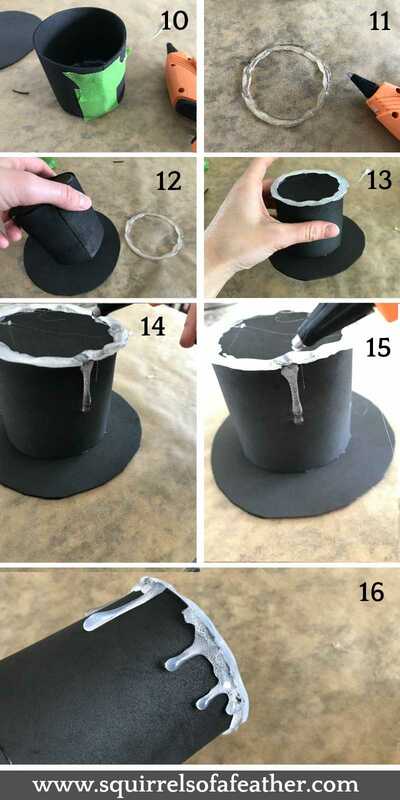 Put some glue on the underneath edges of the top hat (the empty side of the crown) and press it quickly to the very center of the larger black foam circle. Hold until dry. If you are slightly off center, don’t panic and try to move it! You can just trim the edges of the LARGE black circle to make the bottom a nice, even circle around the top. Use the hot glue gun to glue the circle that you made of glue to the top of the hat (so much glue, I know). Allow that to dry. Place the glue gun tip under the crown of the hat and allow it to build up enough that it starts to drip in large droplets down the sides of the hat. Start small; you can always add more drops! Do a little at a time and blow on the drops as they slide towards the bottom of the hat to make them dry faster and prevent from dropping all the way to the bottom (unless you want that effect)! I also glued the back of the seam to cover where it joined together with a nice big droplet. Using the needle and black thread, sew one button onto one of the little wicker loops that run along the sides of the basket. Cut out a tiny little triangle of orange felt and using orange thread attach it to the middle of the smallest basket for the nose. Use a Sharpie marker to color two black eyes onto painter’s tape and then cut them out and stick them onto the smallest baskets for the eyes (or you can use smaller buttons, use a Sharpie marker, or fabric). You are all finished! All you have to do now is tie your snowman’s scarf around his neck gently and place the hat upon his head. Now he is all ready to bring his cheerful snowman charm to your home! Okay, this is really cute. I won’t make it because you’ve seen my crafting ability and this is WAY beyond it. But if I saw this in a store, I would totally buy it. Oh my goodness! This is so cute. I would have never thought to use baskets for this. But now I’m never going to look at the baskets the same in IKEA. Thanks so much, Christene! I don’t know how I looked at these and thought, “Those could be a snowman!” but I’m glad I did, hahaha. You are always so clever! I love the idea of repurposing things you already have in the house. We have so much STUFF that I’m always looking for ways to transition from season to season. Don’t tell my hubby I’m going to cut up his flannel pants, okay? Pinning this! I absolutely adore that you did this with these nesting baskets! So creative and one of the cutest snowmen I have ever seen! This is just too cute, Marissa! What a neat idea from the baskets to the pajama pants! Love! Pinning! This is just so stinkin cute, Such a creative mind Marrisa, love all your original ideas, but this one is my favorite, just too adorable. This is seriously one of the cutest Christmas decor items I’ve seen all year! I LOVE it! Plus, who doesn’t need an excuse to visit IKEA?! Right, IKEA is the best! Thanks, I think he’s pretty cute too. 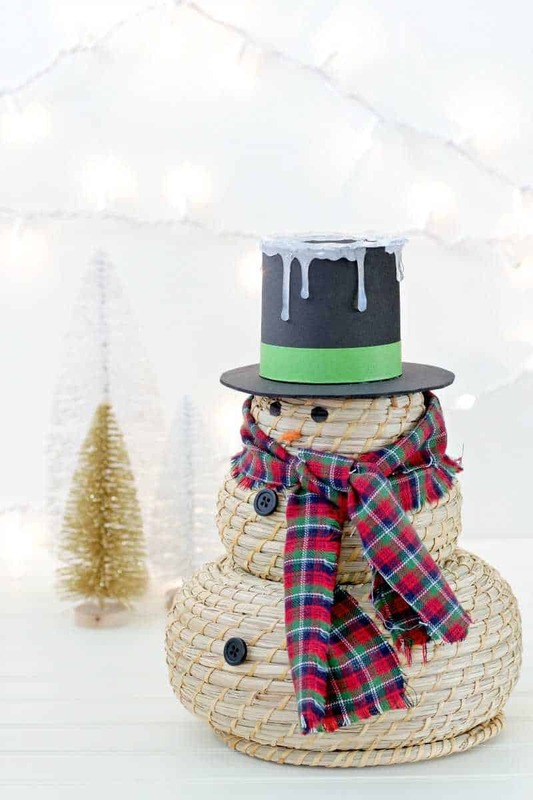 This snowman craft is truly adorable and makes a great gift for a friend. Thanks for sharing! Sure thing Kate, glad you liked it! Thanks, Marissa – My wife is stealing this one to engage the 4 grandboys into a Christmas craft project – Pray for her……….as I will be awol for that event!